View of the newly protected property in the Hudson Highlands.photo: Robert Rodriguez, Jr. One of the most significant preservation opportunities in the Hudson Highlands, this acquisition preserves the continuity of a world-class scenic landscape encompassing Bear Mountain State Park and undeveloped acreage within the U.S. Military Academy. 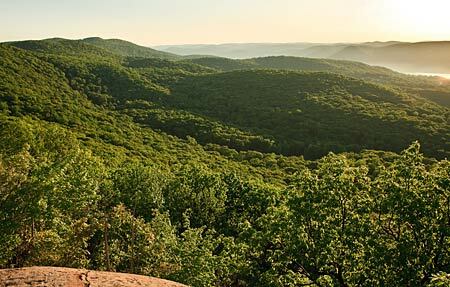 Visible for miles from popular public viewpoints -- including Bear Mountain Bridge, the Appalachian Trail and Hudson Highlands State Park -- Popolopen Ridge features steep slopes, rock outcroppings, streams and wetlands, unbroken forest cover and a significant stand of mountain laurel. The transaction prevents these irreplaceable natural resources from falling prey to sprawling development that desecrated nearby Corbin Hill. In addition to conserving habitat that sustains a diversity of wildlife, protection of Popolopen Ridge safeguards a road that Revolutionary War soldiers may have traveled on to attack and defend nearby Fort Montgomery, now a state historic site. It also affords the possibility of extending hiking trails that offer panoramic vistas of the Highlands, further connecting people with the region's breathtaking natural splendor. The purchase, accomplished in partnership with the Hudson Highlands Land Trust, is part of Scenic Hudson's collaborative campaign to Save the Land That Matters Most, conserving 65,000 acres of great scenic, ecological and agricultural significance.